STARRED review from School Library Connection for THE EYE THAT NEVER SLEEPS which will appear in the January/February 2019 issue. 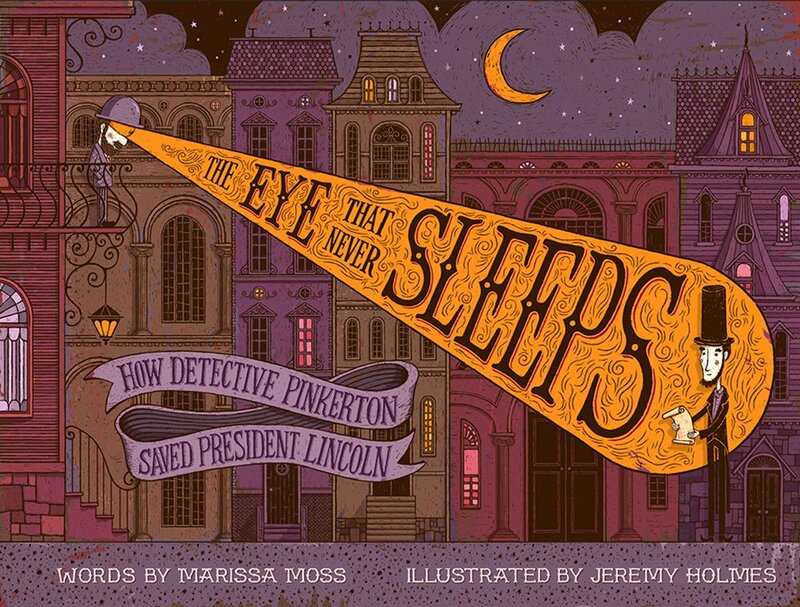 Moss, Marissa The Eye That Never Sleeps: How Detective Pinkerton Saved President Lincoln Allan Pinkerton had a sharp eye, a quick mind, and a desire for justice. After immigrating to the United States from Scotland, he became a successful barrel maker, and his observant eyes helped him dissolve a counterfeit ring. Authorities hired him for his sharp eye and understanding of human nature and behavior in order to solve other crimes. Soon Pinkerton had the best detective agency in the country. When President Lincoln took a train to Washington, D.C., for his inauguration, the Pinkerton Agency was hired to foil a plot to kill Lincoln. By using a second train and rerouting it along a diversionary route, Pinkerton is credited with saving Lincoln’s life even before he was officially president. Few young people, besides history or Lincoln buffs, may know about this page in Lincoln’s life, making the book a useful addition to libraries. The design of the book is also noteworthy. Holmes researched fashion, games, and newspapers to produce period-accurate cartoon illustrations. Digitally rendered scratchboard illustrations on dusty purple, brown, and orange backgrounds effectively recreate the Victorian era, though at times overwhelm the text. Interested readers can also look for Moss’s other book about a Pinkerton agent: Kate Warne: Pinkerton Detective (Creston Books 2017).